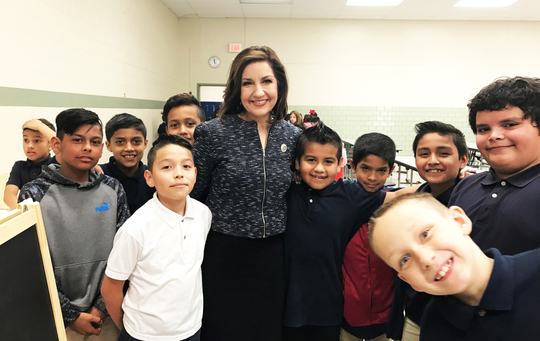 State Superintendent of Public Instruction Joy Hofmeister visits Hamilton Elementary in Tulsa. You are true champions of connection. Researcher Philip Jackson cites evidence that “the elementary school teacher typically engages in 200 to 300 interpersonal exchanges every hour of her working day.” For those of you teaching in middle and high schools, the number is exponentially higher. As state superintendent, my days are similar. My schedule is filled with stakeholder meetings and speaking engagements – but my favorite part of the job is when I’m in the classroom, visiting schools and talking with students. Recently, I stopped by Cleveland Public Schools, about 30 minutes northwest of Tulsa, where the middle school is teaching life skills through its “micro-society.” Students operate many functions of a community, including a bank and a police department. I used their micro-society currency to buy snacks – the cake ball was yummy – and play a student expert in chess. At Hamilton Elementary in Tulsa, the focus on social-emotional learning has dramatically changed school culture despite unique challenges. Students are allowed to self-identify their frustration on an anger scale to process their emotions and make good behavioral choices. In Caney, I visited with students on the NASA design project team. An incredible music program was in full swing at Northwest Classen in Oklahoma City, and I saw teachers making data-driven decisions at both Hugh Bish in Lawton and Epperly Heights in Midwest City. Everywhere I go around the state, I witness firsthand your innovation, resolve and hard work – and that of your students. The commitment of Oklahoma educators motivates me to work harder every day. Thank you, teachers, for all you do to ensure the success of our kids. HB 2018 & HB 2227 – These two bills would give children of certified teachers the opportunity to participate in Oklahoma’s Higher Learning Access Program (OHLAP) by changing the amount of the adjusted gross income that is required to qualify for the program. Introduced by Rep. Nichols and Rep. Russ. HB 1359 – Would create a new law allowing teachers to receive a $500 tax credit for certain classroom expenses. Introduced by Rep. Hasenbeck. HB 2641 – Would create a task force to study the requirements that students need to satisfy in order to graduate with a standard diploma from a public high school in Oklahoma to ensure they are prepared to be successful in life beyond graduation. Introduced by Rep. Baker. SB 158 – Would create preparation material for Oklahoma’s teacher certification exams. The material would be free and would be aligned with what teacher candidates can anticipate to see on the exams. Introduced by Sen. Pederson. 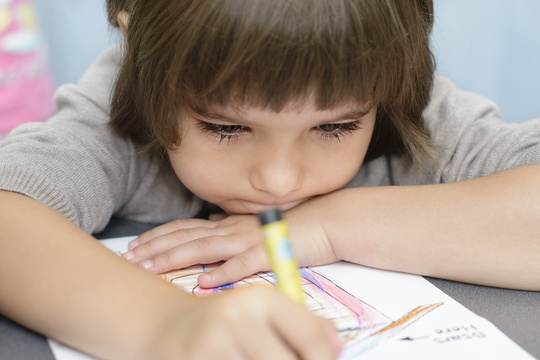 SB 194 – Would remove the requirement that teacher candidates enrolled in elementary or early childhood education pass a comprehensive assessment to measure their teaching skills in the area of reading instruction prior to graduation. Introduced by Sen. Bice. SB 197 - Would modify the definition of the term “career teacher” to include experience in one or more districts. The bill would also give districts the discretion to accept teaching experience and evaluation ratings. Introduced by Sen. Dossett. 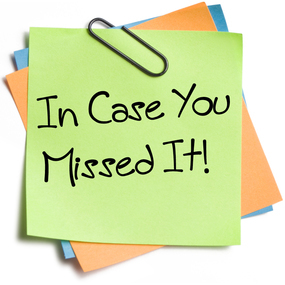 For a helpful resource on following this year’s legislative session, click here. Twenty-six percent of children in the United States will witness or experience a traumatic event before they turn four years old. Trauma-informed schools understand the educational impacts of trauma and are safe, supportive environments where students form positive connections with adults and peers and learn to regulate their emotions. What are some emotions you feel today? What is something you can do to calm your emotions? Are you hurting today? If so, describe what is hurting. Is there something you would like your teacher or someone else to know today? Is there something you need from your teacher today? How am I feeling today? What can I do to regulate myself, so I can be prepared to teach my students? Have I set clear expectations for my classroom? What is the emotional tone of my classroom? Have I greeted all my students by name today? Have I had at least one positive interaction with each student today? Is there a student who needs extra attention or support today? For our trauma-informed instruction guide and other tips for teachers, click here. How do you know if a lesson is a “STEM” lesson? Google “STEM activity” and you’ll see towers, bridges and a lot of projects that use copious amounts of tape, candy and spaghetti. Add “middle school” or “high school” to your search, and you’ll find more wires, gears and robot cars. Some 180 million search results might leave you believing STEM is about building and programming. Instead of asking if a lesson is STEM, we can ask what version of STEM the activity or lesson represents. Let’s try analyzing STEM through the imagery of a soundboard; each discipline can be turned up or down, and the only time STEM isn’t present is when all disciplines are completely turned down. The linked rubric allows you to determine what version a given STEM lesson is. We are then able to decide our goal for our STEM lesson. In order to be fully turned up, a lesson needs to have the Oklahoma Academic Standards for math and science purposefully incorporated, on grade level. Technology needs to be created and used purposefully by students. Finally, engineering knowledge and design (what you do with the technology) needs to incorporate science and math concepts. To learn more about STEM, click here. To bring STEM professional development to your district, click here. 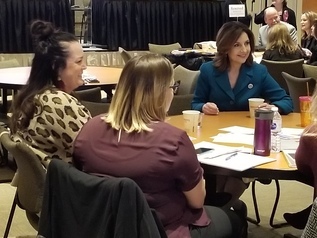 State Superintendent of Public Instruction Joy Hofmeister and Gov. Kevin Stitt tour Broken Arrow High School with National Teacher of the Year Finalist Donna Gradel. Congratulations to Oklahoma’s 2018 Teacher of the Year! In a recent news conference at Broken Arrow High School, Gov. 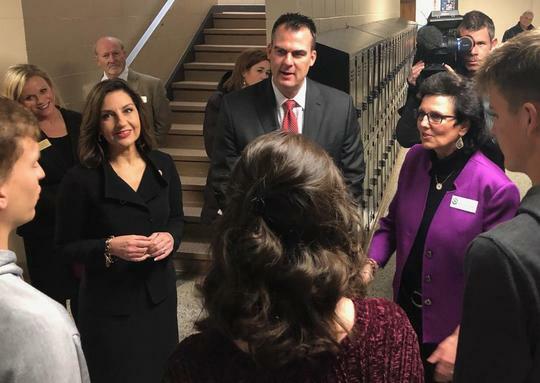 Kevin Stitt and State Superintendent of Public Instruction Joy Hofmeister announced that Donna Gradel has been named one of four finalists for the National Teacher of the Year award. Since July, Gradel has been traveling the state on a 77-country tour as the state’s ambassador of teaching. The goal of her “Year of the Teacher” campaign is to recruit, retain and celebrate Oklahoma teachers. Gradel is the second Oklahoma teacher since 2016 to be named a National Teacher of the Year Finalist. Gradel, who is an environmental science teacher at Broken Arrow, will travel to Washington, D.C., this month, where she and finalists from Alaska, the District of Columbia and Virginia will be interviewed by a national selection committee to determine the National Teacher of the Year. The award will be announced this spring. To watch the video, click here. APPLY NOW FOR STATE TEACHER OF THE YEAR: The 2020 Oklahoma Teacher of the Year application is now available for all district Teachers of the Year. Deadline is May 15. For more information and to download the application, click here. 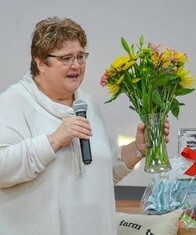 CONGRATULATIONS, CHRISTIE: Christie Puckett, who has taught at Maysville Public Schools for her entire 34-year career, has been selected as the 2019 Oklahoma Ag in the Classroom Teacher of the Year! Puckett has incorporated agricultural lessons into her classes since she began teaching. To find free ag lessons that incorporate the Oklahoma Academic Standards, click here. FORESTRY STIPEND: The Forest Heritage Center Museum is offering scholarships to seniors and stipends for educators to help Oklahoma youth take advantage of the opportunities the forestry industry provides. A $1,000 stipend is available to educators who wish to implement forestry curriculum in their classroom. Apply by March 15. For more information, click here. For free forestry lessons from Project Learning Tree, click here. For other free lessons, search “forestry” on the Ag in the Classroom website. DNA DAY CONTEST: American Society of Human Genetics’ DNA Day Essay Contest is open to students in grades 9-12 and asks students to examine, question and reflect on important concepts in genetics. Students can win up to $1,000 with a matching $1,000 equipment grant for their submitting teacher. Enter by March 8. For more information, click here. 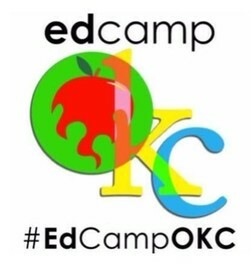 EDCAMP: Attend the free EdCampOKC conference 8:30 a.m. to 4:30 p.m. Feb. 23 at Midwest City Elementary. EdCamp (@edcampokc) is a free “un-conference” for educators to share ideas, collaborate and network together. For a video of what to expect, click here. To register, click here. VIDEO CONTEST: Enter the Operation Prevention Video Challenge by March 6, and your student could win $10,000! High school students have the power to send a message to their peers about the dangers of prescription opioid misuse by creating a 30-60 second original public service announcement. For more information, click here. OSDE’s Office of Assessment has great news for classroom teachers and administrators working with English learners. WIDA now provides access to eLearning modules for all Oklahoma educators with WIDA website logins. Naming a District Learning Coordinator is no longer required. In addition, educators have an additional two months to access the modules – until August 30. Professional development certificates are available for download. For the informational flyer, click here. For login information, click here. ENROLLMENT UPDATE: The number of students in public schools in Oklahoma continues to rise steadily, according to this year’s enrollment data. To read the story, click here. ART ON DISPLAY: Nearly 200 elementary students’ works of art are on display at the Individual Artists of Oklahoma gallery in Oklahoma City. To watch the video, click here. STUDENT SUCCESS SUMMIT: Hundreds of educators and business leaders gathered in Moore for a statewide Student Success Summit to share best practices for preparing Oklahoma students for life after high school. To read the story, click here. ASTRONAUT VISIT: Former astronaut Paul Lockhart, who flew two missions to the International Space Station, challenged Will Rogers students in Tulsa to become the first Americans on Mars. To read the story, click here.